Baclofen Overdose or Brain Death? Baclofen reduces muscle tone and spasticity. It has a delayed peak and prolonged half-life in overdose. Deep coma with absent brain stem reflexes may mimic brain death in overdose. Treatment is symptomatic and supportive, there is no antidote. Baclofen controls muscle spasticity in conditions such as multiple sclerosis and spinal cord injuries. Off-label uses include alcohol dependence, GERD, intractable hiccups, nystagmus, and trigeminal neuralgia. Usual oral doses range from 5-80 mg daily for spasticity to 270 mg or higher daily for alcohol abuse treatment. Automated Intrathecal delivery through an implanted catheter and pump is an option for those who do not tolerate or respond to oral therapy. Overdoses occur from large ingestions in abuse or self-harm attempts or from malfunction of an intrathecal assembly. Chronic therapeutic overdose is possible, especially in the elderly and patients with renal impairment, because baclofen is renally excreted. CNS, respiratory, and cardiovascular depression are common with significant overdoses. The most striking symptom is prolonged, deep coma with absent brain stem reflexes that may mimic brain death. The Missouri Poison Center has actually halted premature organ harvesting in several overdose cases over the years! 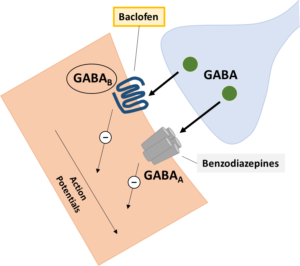 Baclofen stimulates inhibitory GABAB control receptors on excitatory glutamate neurons in the brain and spinal cord. This decreases signals to muscles, which reduces muscle tone and spasticity. Patients typically present with lethargy, weakness, hypotonia, slurred speech and ataxia, and may exhibit hypothermia, abnormal movements, nystagmus, hallucinations, or seizures. After large overdose, cardiac depression with bradycardia and hypotension and deep coma with respiratory depression or apnea are common. CAUTION: Deep coma with absent brain stem reflexes may mimic brain death! A late middle-aged patient arrived to the ED after being found unresponsive by family with a bottle of baclofen nearby. The patient was bradycardic and had several seizures that resolved with benzodiazepine treatment. The patient was intubated, ventilated, and admitted to the hospital. In the ICU they remained unresponsive with no sedation. The following day, the hospital discussed brain death evaluation and consultation for organ donation. This was postponed due to the prolonged effects of baclofen and the patient became more responsive the following day. The literature reports numerous instances of prolonged coma after baclofen overdose. These patients are sometimes assumed to be brain dead and preparations for organ harvesting are underway before someone puts on the brakes. A clinical picture of coma, flaccidity and absent reflexes that mimics brain death can persist for up to 5-7 days after severe overdose. Continue to provide symptomatic and supportive care. Baclofen overdoses are managed with symptomatic and supportive care; there is no antidote. Monitor oxygenation, electrolytes, and renal and hepatic function. There have been reports of QT prolongation so a 12-lead EKG with continuous cardiac monitoring is recommended. The patient will likely require intubation and ventilation and a prolonged ICU stay in significant overdose. Treat hypotension with fluids and vasopressors as needed; atropine may be useful in correcting symptomatic bradycardia. Seizures are managed according to the usual toxic seizure protocol with benzodiazepines as the first-line agent followed by levetiracetam, phenobarbital, or propofol. Baclofen is primarily excreted by the kidneys, greater than 70-85% as unchanged drug. It has relatively low protein binding. Hemodialysis may be of value in overdose, especially in patients with renal failure. There are case reports of patients without renal insufficiency “waking up” after a run of hemodialysis, although they typically do well with supportive care only. Baclofen overdoses can be challenging to manage and symptoms may become severe. Our advice to you is to call the Missouri Poison Center. Our specially trained nurses, pharmacists and medical toxicologist can provide you with the most up-to-date treatment advice on baclofen exposures.